President Elect Doug Johnson called the meeting to order. Stephen Dunn led the meeting in the Pledge of Allegiance. Susan Brints from the Metro Rotary Club of Lubbock, Texas. Mike Lennon, from the Rotary Club of Calistoga. Richard Lazovick, i tech tutor and guest of Steve Marburger. Paul Pisaro, mortgage broker and guest of Nicole Le. Marianne Messer guest of Kathleen Archer. Tim Delaney announced that the raffle has grown to $127. 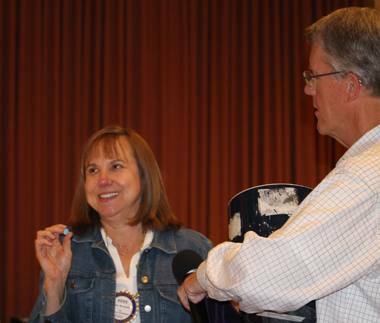 Rotarian Vicki Hardcstle was unable to draw the winning marble and received the $10 consolation prize. 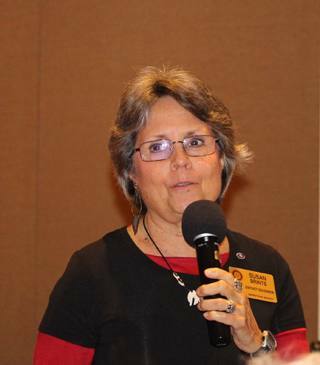 Rotarian Debi Zaft reminded everyone that April is the Rotary magazine month. All Rotarians are asked to read the April edition of the magazine. The club’s goal is to have 100% readership. Please sign in when you have completed reading the magazine. The question this week was “What is crucial not only for our children, but for all children?” Jackie McMillan provided the correct answer, “Immunization”. Elizabeth Karbousky introduced the three Rotarians who celebrate their birthdays in the month of April. Ginny Cannon, Gesine Franchetti and Debi Zaft. 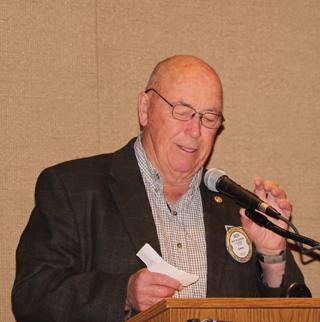 Doug Johnson announced that Shannon McConnell has resigned from the Rotary Board due to family matters. The Board has appointed Gesine Franchetti to serve out the remainder of Shannon’s term of office. 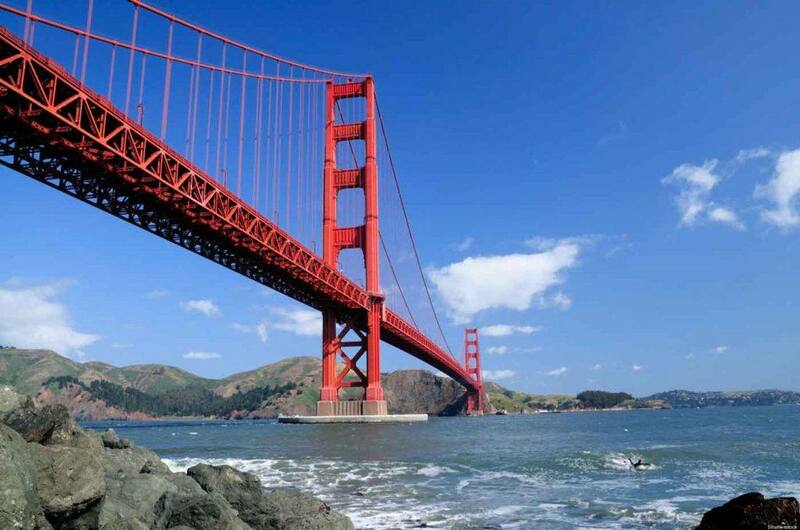 Don McMillan is looking for volunteers to travel to Marin County on April 12th and place signs and posters advertising our Giro Bello. The response last week was disappointing and we need active participation of all Rotarians in this important event. Rotarians are encouraged to contact Don if they are available to participate. Sign up for volunteers to work at the Giro Bello will begin next week. Rotarians are asked to please become engaged in this important event. If you are interested in participating to make this fundraiser a success please contact Doug Johnson or Don McMillan. Doug Johnson reported that registrations for the Giro Bello are on track with last years’ ridership. However, our goal for this year is to increase ridership. Your involvement is crucial. Success will be guaranteed only if we all work hard to realize the goal. Yale Abrams announced that our hands on work day is scheduled for April 12 from 9:00 am to 12:00 noon. There is still an opportunity to sign up to work at the Laguna de Santa Rosa. Information about the workday will be emailed to volunteers. 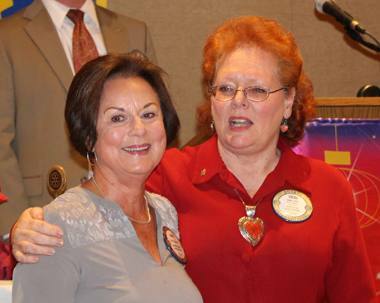 President-elect Doug presented Ginny Cannon, our Rotarian of the Month. Ginny has been a Rotarian since 2011 and has worked tirelessly behind the scenes to make our Rotary activities a success. Congratulations to Ginny for a job well done. Emily Harrington was recognized for being named by the Business Journal to its list of 40 top business people under 40. Emily works for Summit State Bank and donated $50 to the club and $50 to our Foundation. Marnie Goldschlag donated $25 to the club for travels past and her daughter who is attending University of Nevada at Reno. Marnie asked if Robby Fouts might be interested in being recognized for work she referred him to on a real estate transaction. Robby gladly donated $50 to the Jack Levar Scholarship Fund, $50 to the John Brown Scholarship Fund, $50 to his daughter’s Paul Harris and $50 to the club. Rich DeLambert donated $20 to the club for two trips he recently took. Layne Bowen provided an update on his musical bookings over the next few weeks and offered to donate $1 for each Rotarian who attends one of the venues he is playing at. In addition, Layne donated $25 to the club. Jeanne Levin has been catching rain water in barrels on her property and recently received a $1,500 rebate from the local water agency for her conservation efforts. Jeanne donated $50 to the John Brown Scholarship Fund because of her financial windfall. Casey D’Angelo announced that he is retiring in June from his position as Superintendent of Schools in the Rincon Valley District. To celebrate his retirement he donated $50 to the club. Jack Atkin announced that his two sons are not getting married but he is excited because both of them have dates in the next 30 days. Jack donated $50 to the club because he was so happy for his sons and optimistic about their future. Nicole Le had a wonderful family outing in Disneyland and donated $50 to her son’s Paul Harris. Jackie McMillan Introduced our guest speaker, Susan Brints. 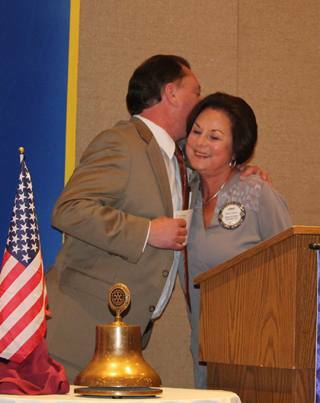 Susan and her husband Cal are members of the Metropolitan Lubbock Rotary Club. She will serve as District 5730 Governor in the year 2016-17. Susan has also served as an Assistant Governor, is a Past President of her Rotary Club and has served on numerous club and district committees. She is presently serving on the district and club Rotary Youth Exchange Committees, and serves her district as Global Grants Chair on the Foundation Committee. Ms. Brints emphasized the importance of leveraging club resources with those available at the District and Foundation level. There are three major funds in Rotary International’s Foundation that a club can direct it’s giving. The Annual Fund, the Endowment Fund and Polio Plus. By leveraging its funds a club can increase the amount of money available for a project seven fold. An example is the Kenya Project of the Allen Rotary Club. Their $5,000 dollar contribution was able to increase to $39,000 by using World Fund Match and District Designated Funds. Ms. Brints provided an example of how her club was able to successfully fund a project in Malawi, Africa. By working with the community there, Rotary was able to provide assistance to the Grace Center, an orphanage operated by the Grace Alliance Church. Using a Global Humanitarian they were able to provide a deep water well for the Center. With a Global Grant in 2013 they were able to establish a goat and nutrition project. Rotary has also been able to improve the nutrition of the children at the center while improving the hygiene and teaching safe food preparation. In 2014 by using monies from a Global Grant, Rotary was able to improve the education of the children, develop a health clinic and implement better agricultural practices. They are also working to teach textile practices that will improve the economic base of the Center. Ms. Brints emphasized that if you want to go fast you go it alone. If you want to go far you go it together. We should take advantage of the opportunities that the Rotary Foundation and the District Grants provide. Together they can make a difference in our international projects. President elect Doug Johnson closed the meeting with a reminder to get involved with our major fund raiser, the Giro Bello. The club is actively looking for members in these classifications: Beverages, Ceramic, Coal, Confections, Leather, Paints, Paper, Photography, Plumbing, Metal Working, Vehicle Industry. Current members maintained an attendance rate of 97%. The Board authorized sending the President to the International Convention.